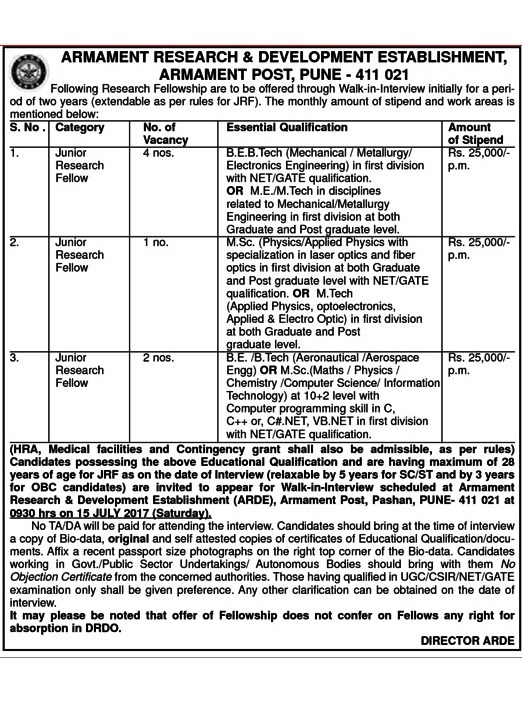 ARDE (Armament Research and Development Establishment), Pune Published Job Notification for 07 JRF Posts. Candidates who wish to apply must look at ARDE JRF Recruitment 2017. Eligible candidates can apply online / offline before 15-07-2017 (15th July 2017). Education Qualification: B.E.B.Tech. (Mechanical/ Metallugy/ Electronics Engineering)/ M/Sc. (Physics/ Applied Physics)/ B.E. / B.Tech (Aeronautical/ Aeroscape Engineering). For Post wise Education Details follow the detailed advertisement. Age Limit: 28 years. relaxation up to 5 years for SC/ ST candidates, 3 years for OBC candidates. Interested & Eligible candidates may attend for walk in interview along with all the documents addressed at Armament Research and Development Establishment, Amament PO, Pashan, Pune, Maharashtra 411021. Starting Date, Last Date to Apply Online at Armament Research and Development Establishment which candidates should be remember as follows.